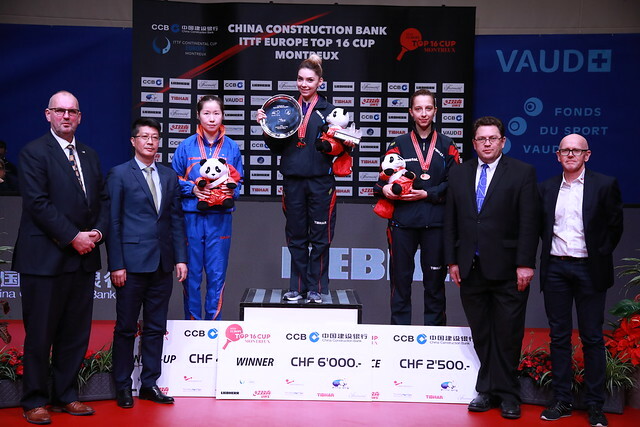 Sunday 4th February marked the closing day of the China Construction Bank 2018 ITTF-Europe Top 16 Cup and spectators were treated to a spectacular finale in the Swiss city of Montreux as the defending champions missed out on the titles, Timo Boll added another trophy to his collection and a new champion was crowned. The day began with semi-finals action in the Women’s Singles event as the four remaining competitors fought it out in the race to reach the final. Romanian fans experienced mixed emotions in the morning session of play as Bernadette Szocs and Elizabeta Samara came away from their respective encounters with opposite outcomes. Szocs put in another outstanding performance in the opening match of day two, defeating Swedish opponent Matilda Ekholm in straight games (11-7, 11-9, 11-9, 11-9) to book her spot in the title contest but for Samara there were scenes of disappointment as the second seed lost out to defending champion Li Jie (11-13, 11-7, 9-11, 6-11, 11-13). 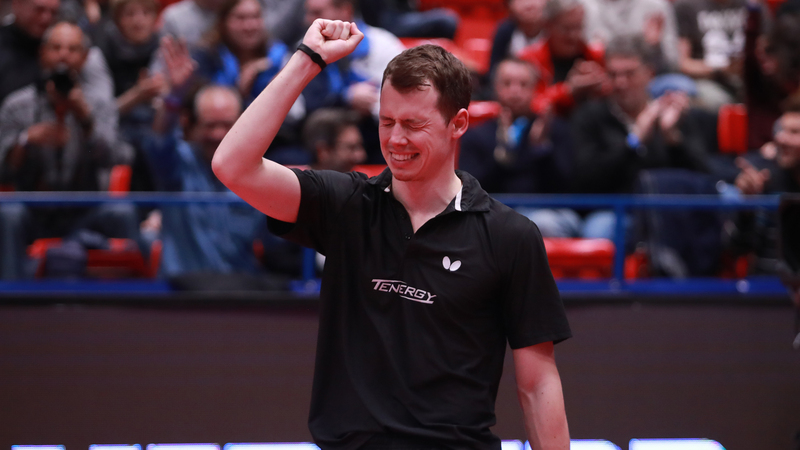 In the Men’s Singles competition there were two excellent ties in the last four: the bottom of the draw saw five-time champions Timo Boll and Vladimir Samsonov meet while World no.1 Dimitrij Ovtcharov went head-to-head with one of the standout performers in Montreux, Jonathan Groth. The semi-finals resulted in victories for the top two seeded players as Ovtcharov and Boll held off brave challenges from Groth (12-10, 11-7, 11-9, 9-11, 12-10) and Samsonov (10-12, 11-6, 11-4, 12-14, 11-5, 12-10) to set up an all-German final for the first time in the history of the tournament. While Groth’s dreams of reaching the final were dashed earlier in the day the no.9 seed from Denmark rounded off his fantastic campaign in Montreux with a superb victory over Samsonov (7-11, 11-9, 11-9, 12-10, 4-11, 9-11, 11-6) to win the bronze medal on only his second appearance at the Europe Top 16 and earn his invitation for the Liebherr 2018 ITTF-Men’s World Cup. Over in the Women’s Singles third-place play-off match it was Samara who came away with the bronze medal following a six games triumph against Ekholm (11-4, 8-11, 11-6, 11-9, 8-11, 11-8) but the Romanian was disappointed to miss out on the title. The penultimate fixture of the day produced a moment of magic for Romania as Bernadette Szocs lifted the Women’s Singles trophy for the first time. Against the odds Szocs upset the seeding to overcome Li Jie across five games (12-10, 8-11, 11-6, 11-5, 11-7), a result which has done wonders for the Romanian star’s confidence. Then came the highly anticipated Men’s Singles final where the top two seeded players met face-to-face for the gold medal. Ovtcharov arguably entered the tie as the slight favourite having prevailed against Boll in their previous two encounters on the world stage, however, it was the latter athlete who celebrated success in Montreux as Boll stormed to a clean sweep victory over his fellow countryman (13-11, 11-6, 11-3, 11-6) to capture the title for the sixth occasion.